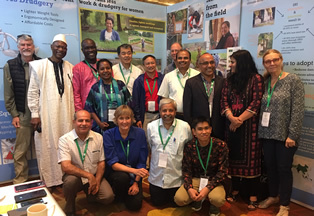 Dr. Eiji also joined the global SRI community at the 5th International Rice Congress that was held in Singapore (IRC) on October 15-17, 2018. 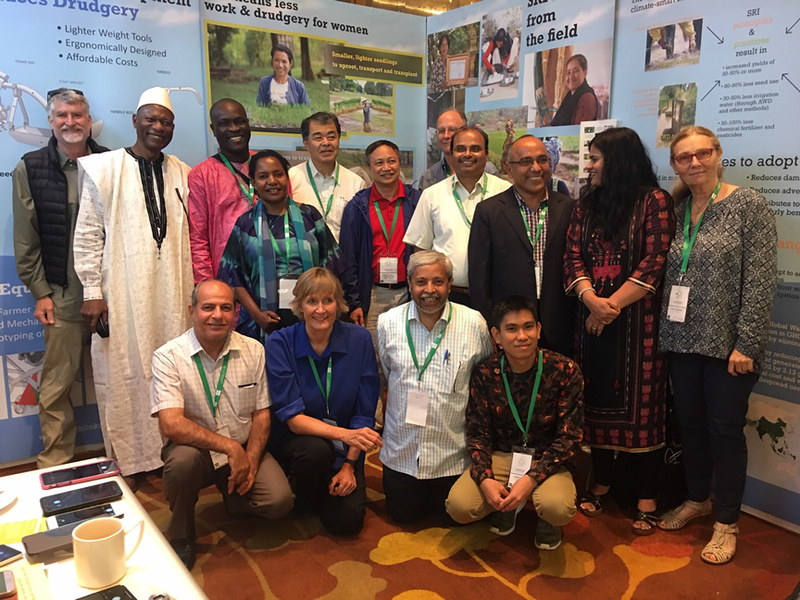 During the IRC, he joined the SRI Research side event and helped man the SRI-Rice/Oxfam System of Rice Intensification booth. He is shown at left with other members of the global SRI Community who took part in the event. [July 25, 2016] The J-SRI Study Group's bimonthly study group met on July 20, 2016, at University of Tokyo. Nguyen Khoi Nghia, Lecturer, at Cantho University, Vietnam, spoke on Utilization of organic fertilizer to increase paddy growth and productivity using System of Rice Intensification (SRI) method under green house conditions; Yamaji Eiji gave a review of Taiwan's newly formed Society of Conservation Agriculture - System of Rice Intensification; and Shuici Sato presented the J-SRI Study Group's version of "What is SRI farming." Other topics included progress with Cambodia rain-fed rice farmers and SRI projects in Japan (see photo at right of project near Tsukuba as well as item below). J-SRI members meet every other month at the University of Tokyo. For more information see the J-SRI website or write j-sri-hq [at] iai.ga.a.u-tokyo.ac.jp. [May 5, 2016] While field activities of the J-SRI Network is most numerous in SE Asia, SRI trials in Japan are now in their second year at Shishizuka Field, near Tsukuba. Ten-day-old seedlings were transplanted into heavily-mulched fields on May 1, 2016 (right). Excellent photos of the entire process are available on the Natural farming rice field school (自然農田んぼ塾) blog. 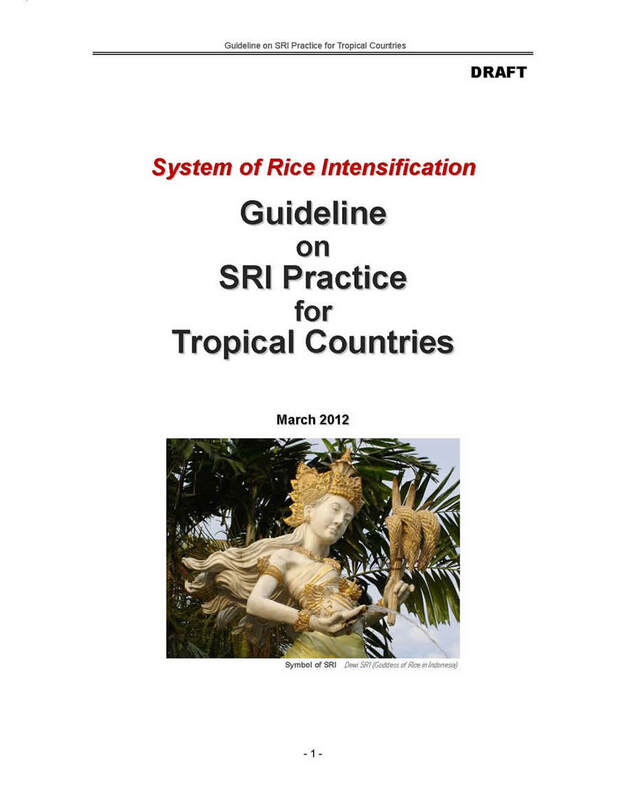 A 16-page practical manual, System of Rice Intensification: Guideline on SRI Practice for Tropical Countries, was produced by the Japan Association of the System of Rice Intensification during March 2012. The publication, shown at left, is now available online on the System of Rice Intensification website. A book about SRI, Rice Cultivation Revolution: SRI -- Saving the World from Famine, Poverty and Water Scarcity, was published during September 2011. Edited by J-SRI, the 351-page Japanese language publication (shown at right) contains 15 chapters of experiences of practitioners and researchers from around the world. Contact J-SRI for more information. Copies can also be purchased from Amazon.com. The Tokyo Development Learning Center (TDLC), in collaboration with the NGO Zutto Sustainable and i-i-network, held the online "Workshop for International System for rice Intensification" on October 28, 2008. Participants included farmers and thematic specialists from governments, academic institutes, and non-governmental organizations supporting SRI programs and/or conducting research on SRI in the region. Cambodia, Indonesia, Japan and the United States were connected via the World Bank's Global Development Learning Network, and this workshop provided a platform for information sharing and discussions for farmers, NGO officials and researchers in the region to share local experiences, knowledge and practices on SRI. A 200 minute video of the workshop is also available. In April 2007, a Japan Association for System of Rice Intensification, referred to as J-SRI, was established, with a secretariat at the University of Tokyo in the Department of Global Agricultural Sciences, with membership from other Japanese institutions and abroad, and with its own website. In July, 2007, J-SRI invited Norman Uphoff from Cornell to visit Japan and give a public lecture at the University of Tokyo and make presentations also to other institutions (see trip report). J-SRI has conducted regular meetings from 2007 to the present. (See schedule). Rewari, Gulshan. 2017. Reduction of greenhouse gases emission from paddy fields. RiceOutlook website. Feburary. 16. Noborio, K., Y. Kudo, T. Kato, and N. Shimoozono. 2012. Effects of water management practices on paddy rice yield and emission of greenhouse gases. Paper presented at the International Conference of Agricultural Engineering: CIGR-Ageng 2012, Valencia, Spain, July 8-12. 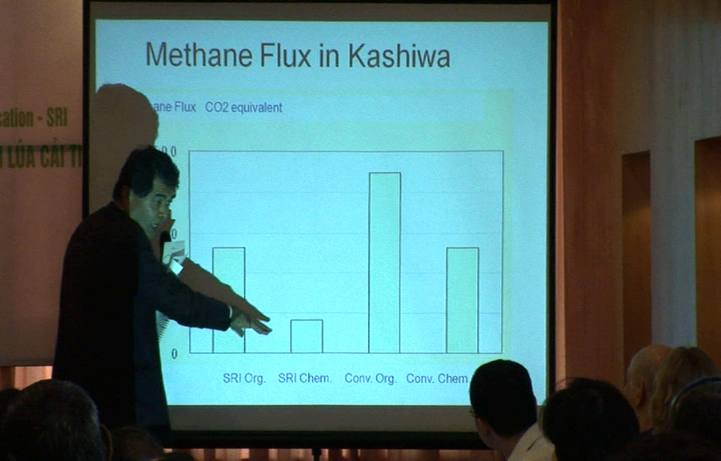 PowerPoint presentation by Yamaji Eiji (shown at right), University of Tokyo, at the International Conference to Exchange Experience in Adoption and Adaptation of the System of Rice Intensification (Pre-Congress "SRI Day" at the 3rd International Rice Congress) 3rd International Rice Congress, held in Hanoi, Vietnam, November 8. 27 slides.